With a history that goes back to the opening of our practice in 1950, it’s inevitable that some things will have changed at Lexington Dental Associates over the years. There are new faces, new technologies, new patients, and – as of fairly recently – a new location. But you’d be surprised at how much has stayed the same in the 60-plus years that this unique family dental practice has been serving the Lexington community. The general dental practice that would become Lexington Dental Associates was founded by Dr. Richard Saulnier immediately after he graduated from Tufts Dental School in 1950. Dr. Victor Saulnier, his brother, also had a dental degree but opted to teach. “He was on the faculty of Tufts Dental School in the department of radiology for more than 40 years, and Dr. Berty, Dr. Ryan and I were all taught by him,” says Dr. Ann Demeranville, D.M.D. Dr. Demeranville joined the practice in 1971 as a dental hygienist, but when she decided to attend dental school herself and needed to take pre-dental courses at Wellesley College, Dr. Saulnier graciously allowed her to work part-time. In 1975, she entered dental school at Tufts on a full scholarship through the U.S. Navy, after which she served tours of duty in San Diego, CA, and Norfolk, VA.
“Dr. Saulnier and I kept in touch during those years,” she says, “and after my military service was completed, my first thought was to return to Lexington and to join Dr. Saulnier’s practice.” And when she was hired back in 1983 as an associate dentist, Dr. Demeranville was able to work part-time with a flexible schedule to accommodate her role as a new mother. When Dr. Demeranville did purchase the practice, the name of the office changed to Lexington Dental Associates. Dr. Saulnier continued to work part-time at the practice for another 4 years, commuting each week from the Cape. Also joining the practice around this time was Dr. John Ryan, D.M.D., who had also been a student of Dr. Saulnier’s brother. Dr. Ryan specializes in dental restorations using CEREC CAD/CAM methods that make it possible to have superior quality crowns made with a much shorter waiting time. Dr. Pascale Berty, D.M.D., has been with the practice since 2007. She had been working at another practice in Winchester but wanted to live and work in the same town, so when she saw an advertisement Dr. Demeranville had placed seeking a dentist to join the practice, she quickly answered. “We clicked right away because we’d both attended Tufts and had worked as hygienists,” she says. Dr. Berty never worked with Dr. Richard Saulnier, but his brother Dr. Victor Saulnier had been one of her teachers at Tufts. 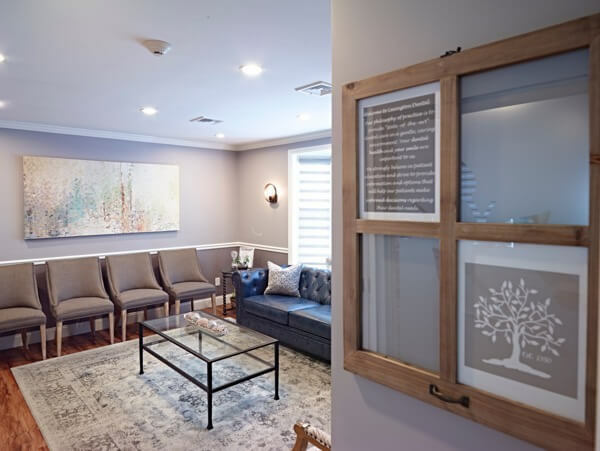 Family has played an important role in this dental practice, right from the start – not only because the founder’s brother taught many of the doctors who practice here, but because staff members are treated so much like family. The friendly, supportive atmosphere of the practice has been a big part of the reason why both employees and patients have stayed with Lexington Dental Associates. Dr. Demeranville has been involved with the practice since the 1970s, but there are other employees who have also been a part of the Lexington Dental family for many years. For instance, dental assistant Diane Zani, who is now retired on the Cape, worked with Dr. Saulnier in the early 1960s and then rejoined the practice as Dr. Demeranville’s first assistant in 1983 and proceeded to work another 16 years with her. And Karen Fischer, a long-time Lexington resident who is now retired, was Dr. Saulnier’s first hygienist in 1950. She left the practice to raise her family, but then returned in the 1980s and worked here for another 20 years. Some veterans of our practice are still going strong, such as dental hygienists Eileen, who has been with the practice for close to 30 years; Sandy, a Dental Assistant who has also been with Lexington Dental Associates for three decades; Jessie, who graduated from the Forsyth School of Dental Hygiene in 1999 and has worked at LDA ever since; and Ann Sullivan, who has worked here since 1997. The Lexington Dental family clearly has a philosophy that, put into practice, encourages loyalty and makes both staff members and patients feel appreciated. Lexington Dental Associates also puts its philosophy of care into practice by sponsoring local charity events, donating to Lexington area cultural societies, and being involved in the community in other ways. From 2014-2016 alone, LDA supported and/or participated in events for medical charities such as the Leukemia and Lymphoma Society, the Boston Marathon Jimmy Fund Walk, the Avon Walk to End Breast Cancer and more; local civic organizations including the Massachusetts Police Association and Lexington Police Association; groups in the arts such as the Lexington Pops Chorus, Boston Skyline Chorus, Commonwealth Chorale, Master Singers of Lexington, Philharmonic Society of Arlington and others; and poverty/disaster relief charities such as Joan’s Food Pantry and Direct Relief. The leadership of Lexington Dental makes sure that the causes the practice supports run the gamut of civic needs – from community associations to cultural organizations, from helping the less fortunate to raising funds for cancer research, and much more. Continuity is important in a practice like Lexington Dental Associates, where there are both employees and patients who have been coming back for decades – but in a field like dentistry, keeping up with the latest technology is just as important. Lexington Dental Associates has met that need in several ways. Moving to a new building in 2015 provided a way to expand, create a more accessible and convenient space for patients, make room for new technology and give the decades-old practice a fresher look. Dr. Berty says the doctors of Lexington Dental also keep abreast of new dental technologies by being members of a Spear Dental Study Club – a cutting-edge clinic where general practitioners and specialists alike meet to learn about new dental techniques. And when the practice needed an in-house specialist in implant dentistry, the Lexington team added Dr. Robert M. Solomon, D.M.D., M.M.Sc. Dr. Solomon joined the LDA staff in 2013 as a periodontist and implant surgeon. His area of expertise is a perfect example of how Lexington Dental is constantly moving forward in terms of the latest in dental technology. But he says all the doctors at LDA are always learning, even while keeping the friendly, patient-centered feel the office is known for. Lexington Dental Associates is a general dental practice that has a traditional, welcoming feel, but is also forward-thinking – and has been ever since Dr. Saulnier proved that he was decades ahead of his time by offering flex-time as a scheduling option. We do our best to combine the best elements of tradition and technology to offer the best care to our patients, and we’re proud to have been a part of the Lexington community since 1950.